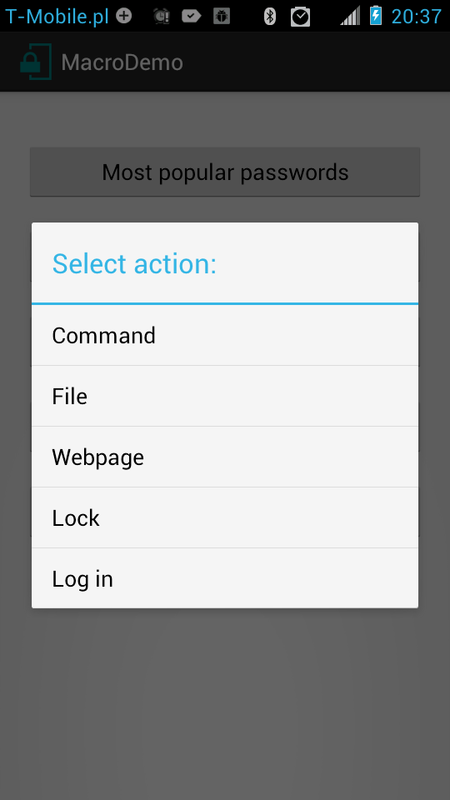 By pressing first button, application uses InputStick to type consecutive passwords form the TOP25 passwords list, each followed with "Enter" key. 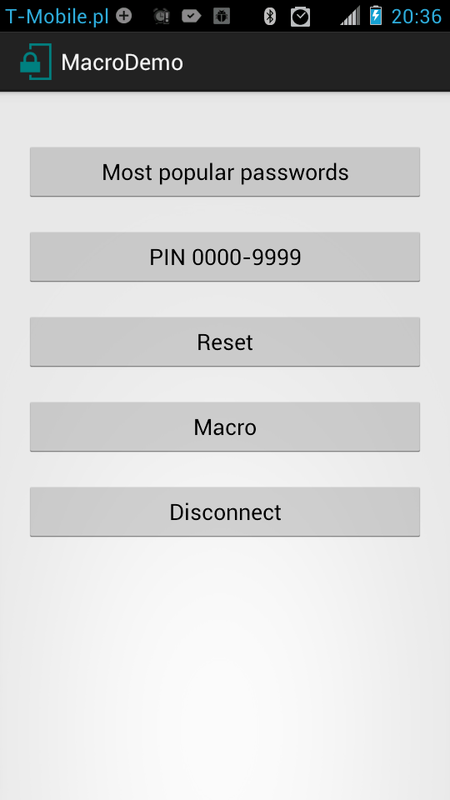 Second button allows to brute force 4 digit PIN code, by typing all possible codes from 0000 to 9999, again "Enter" is pressed after each combination . If you want to start over from "0000" or from first password from the list, use "Reset" button. 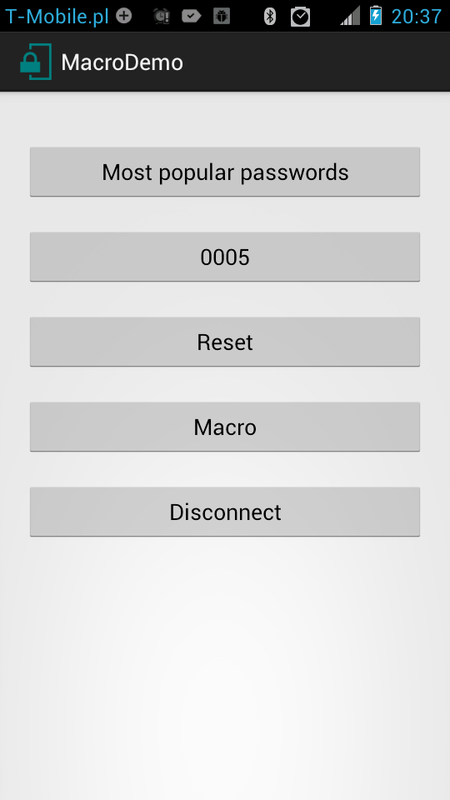 Trying to brute force password, using "TOP25 passwords" list. Trying to brute force 4 digit PIN code. Now let's see what can be done using "Macro" button. Note: I've made an assumption that target machine runs on Windows OS. First option allows to enter command using command prompt. To open command prompt application uses InputStick to enter WIN+R combination (which opens "Run" dialog), type "cmd" and press "Enter" key. 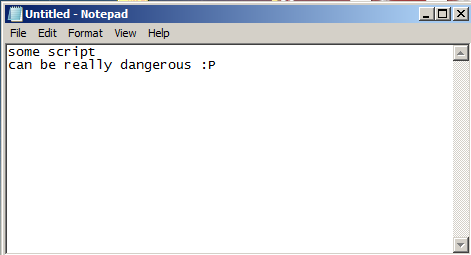 As a result, command prompt window appears. Now command can by entered, in this example: "ping 127.0.0.1 -t", and finally "Enter" key is pressed. Second option allows to store a file on local file system. First step is the same as in previous case, except this time "notepad" is launched. Now application can type content of file to be saved. Finally "Ctrl+s" combination is pressed to launch "Save As..." dialog window, application types absolute path and a file name, for example: "C:\script.txt" and "Enter" key is pressed to confirm. "Webpage" option allows to open Internet Explorer browser and go to a specified web address. Again, "Run" dialog is launched. This time, application types "iexplore blog.inputstick.com" and presses "Enter", what results in opening my blog in Internet Explorer browser. 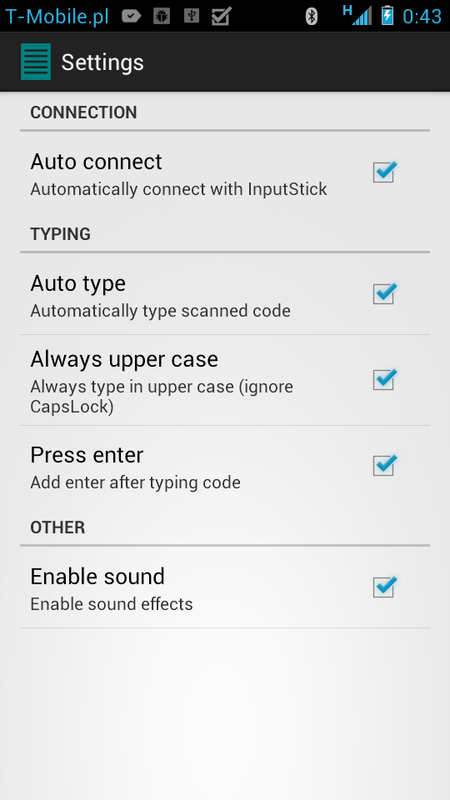 In Main activity there are four buttons: "Scan" to scan barcode/QR code, "Type" to type result, "Connect" to initiate connection to InputStick device and finally "Settings" to open Settings activity. Here we can configure applications behaviour. I think checkboxes are pretty much self explanatory. OK, lets see how it works. 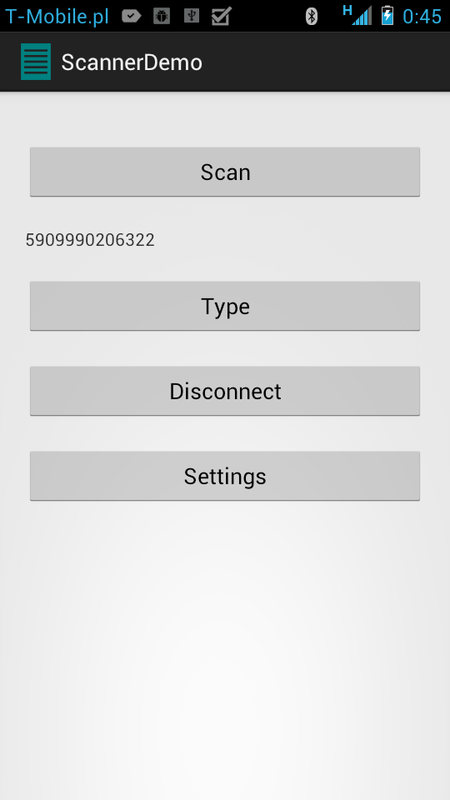 After pressing "Scan" button we can use phone to scan a code, which will then appear below "Scan" button. 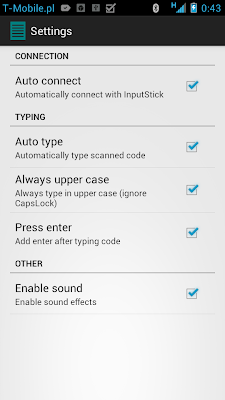 We can use "Type" button to type it using InputStick. Spreadsheet application (Open Office Calc). 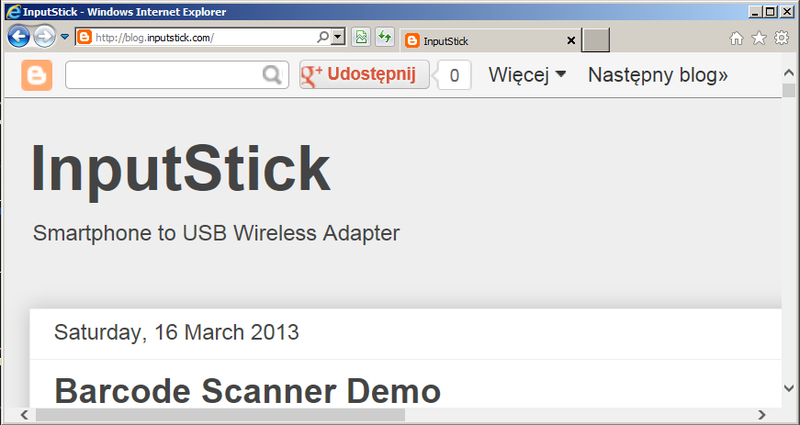 DevicesList: list of all associated InputStick devices. 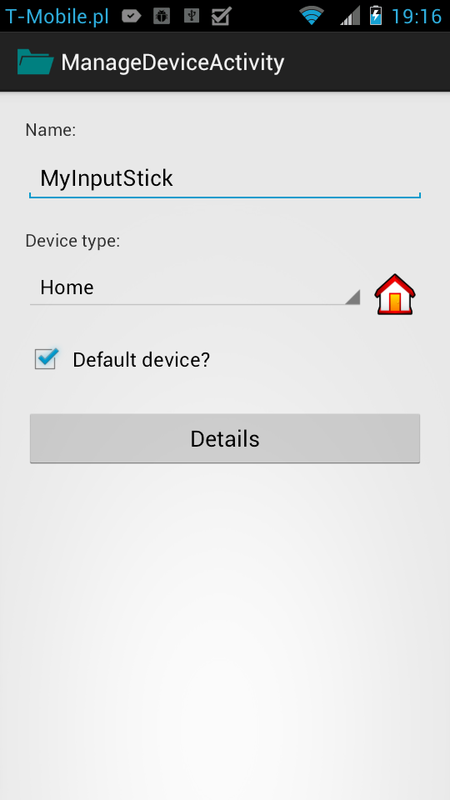 DeviceProperties: this activity allows to edit basic device properties: name and type. Possible types are: Home, Office, Travel, Other. This allows to associate given device with its most common use case. 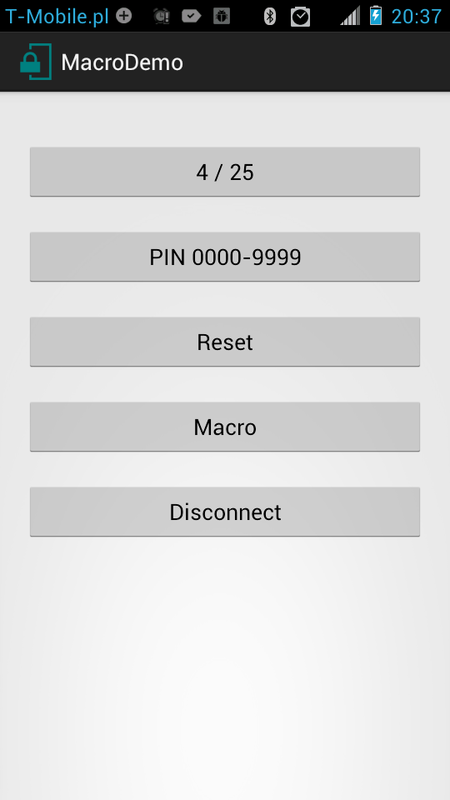 DeviceDetails: displays detailed device information (firmware version etc). 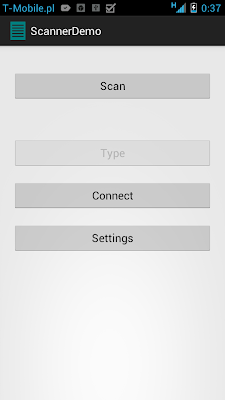 FirmwareUpgrade: allows to flash firmware via Bluetooth, there is no need to disassemble device and connect debugger interface. Really important feature, since now when new firmware is released anyone is able to flash it. 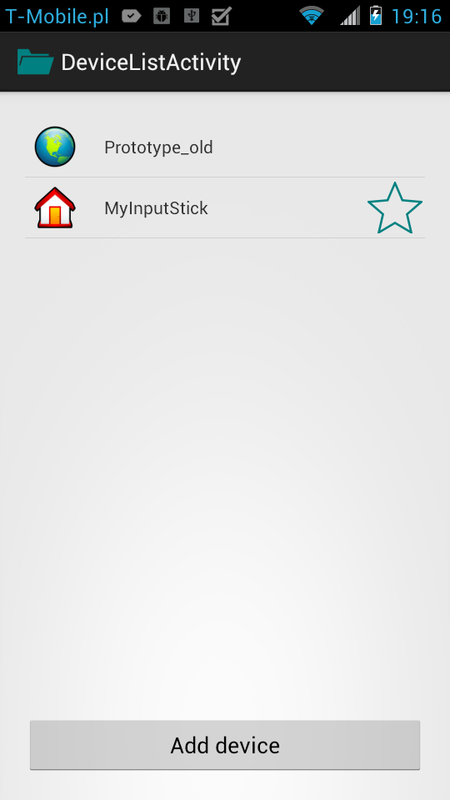 AddDevice: here we can add new InputStick device. In order to do that we need to know its MAC address. There are three possible ways to enter it: scan QR code, use Bluetooth discovery or just manually type it. When correct MAC address is entered application can move on to the next step. Verification: in this step DeviceManager attempts to connect to given MAC address and confirm that it is in fact compatible InputStick device. If everything goes OK, device is added and we are asked if we want to edit its properties. Settings: here we can choose if we want to be notified everytime some application receives MAC address. We can also specify under what conditions we will be asked to manually select InputStick device. There are three possibilities: 1) Always - dialog will be displayed everytime, even if there is only one InputStick available (this way we are always aware of the fact that some application attempts connection). 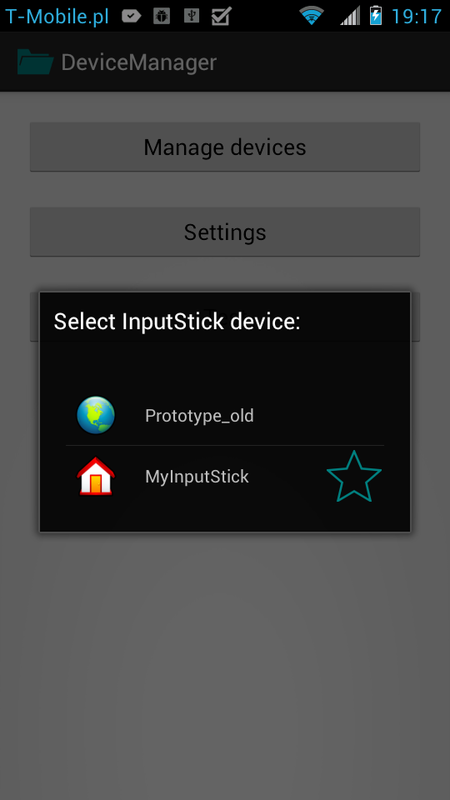 2) Only if necessary - dialog will be displayed only if there is more than one InputStick device associated. If there is only one, user will not be bothered. 3) Never - if there is more than one device then the default one will be used (device can be marked as the default device). This is intended for cases when there are several devices associated, but only one of them is used 99.9% of time and we find dialog annoying. 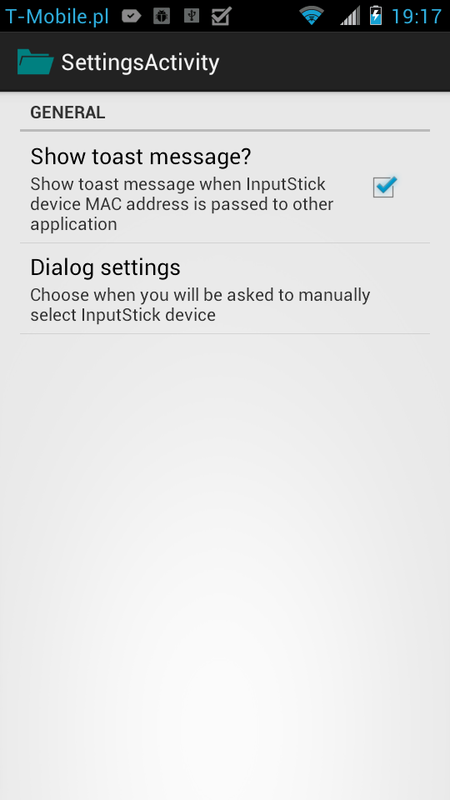 Dialog: When some application wants to get MAC address of InputStick device, we will see following dialog: which will allow us to select desired device (of course depending on settings we may not see this dialog at all).